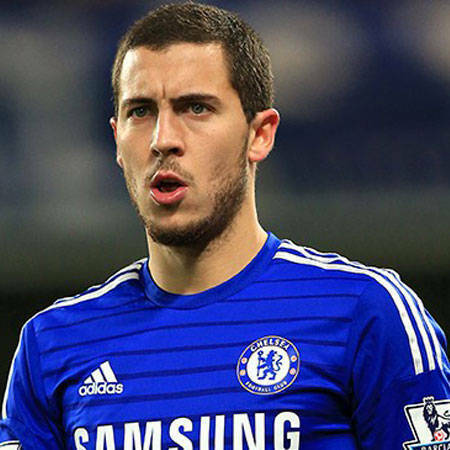 Eden Hazard is a Belgian professional footballer who plays for Premier League club Chelsea and the Belgian national team. He plays mainly as an attacking midfielder but can also play as a wide midfielder. He joined Chelsea in 2012. Born Eden Michael Hazard on January 7, 1991 in La Louvière, Belgium, to Carine and Thierry Hazard, he began his football career for the Royal Stade Brainois youth club when he was four years old. He debuted with Belgium’s national team in 2008. He has been married to Natacha Hazard since 2012. They have three children: Leo, Yannis and Samy. *He began his youth career with Royal Stade Brainois at age 4. *He played for U-17 and U-19 national teams. *He won the FWA Footballer of the Year and PFA Players’ Player of the Year awards in 2014-2015 season. *He is best known for his playing style, which has led to the media, coaches, and players drawing comparisons to Ballon d’Or winners Lionel Messi and Cristiano Ronaldo.